WASHINGTON — The U.S. and Russia used the 70th anniversary of the United Nations General Assembly on Monday to call for cooperation publicly, while harshly chastising each other in the process. Hours before meeting with U.S. President Barack Obama, Russian President Vladimir Putin pointedly accused the U.S. of being an elitist, know-it-all. “If that happens without consequence in Ukraine, it could happen to any nation gathered here today. That’s the basis of the sanctions that the United States and our partners impose on Russia,” said Obama. Taking note of the chilly relations between the two presidents plus Russian attempts to project its power in the Western Hemisphere and its takeover of Ukrainian territory, a growing number of western observers have suggested the Cold War has resumed. But Obama dismissed such talk as a by-product of Russian propaganda. 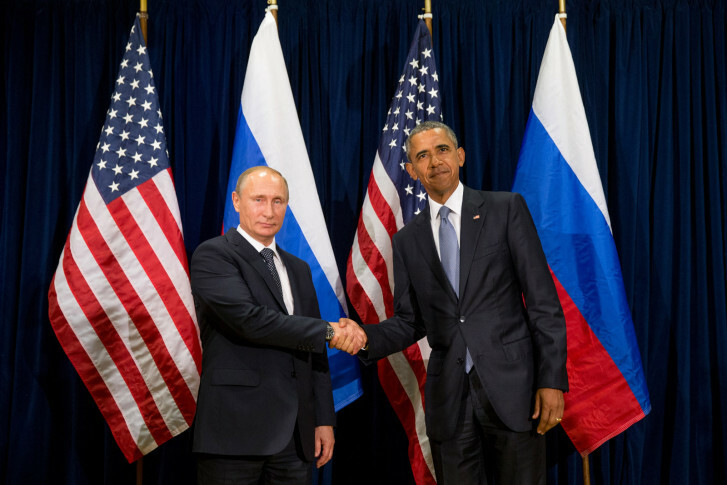 Obama also suggested Russia’s power grab has backfired. Continuing to publicly push Russia to retreat from Ukraine, Obama suggested Russian claims of working for a better world may be more talk than action. “Imagine if, instead, Russia had engaged in true diplomacy, and worked with Ukraine and the international community to ensure its interests were protected. That would be better for Ukraine, but also better for Russia, and better for the world,” he said. Andrew Weiss, vice president for studies at the Carnegie Endowment for International Peace, where he oversees research in Washington and Moscow on Russia and Eurasia, told WTOP recently that it’s hard to predict Russia’s behavior on international issues related to the U.S. He suggested Russia has tried to cover its weaknesses by employing unusual tactics to remain relevant on the world stage. “That’s why you see a lot more use of these unconventional tactics, whether it’s the so-called hybrid war we’re seeing in Ukraine or tools promoting corruption and other sorts of dirty dealing — with the elites taking power in countries across the former Soviet Union,” said Weiss. Both leaders publicly stressed interest in working for the good of each other’s nations and the world, but the frosty language on display at the general session suggested moving from interest to action would be a difficult proposition during and after their private meeting.